Anheuser-Busch likes to make references to Prohibition, and the brewery tour and visitor center have many references to the diesel engines and the ice cream and everything else that the company made during Prohibition to stay afloat. 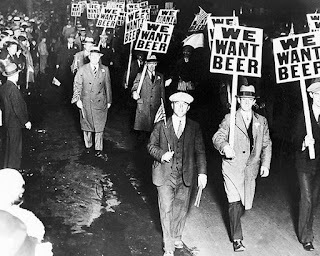 Well now the people behind the Budweiser brand are trying to push Prohibition Day as a holiday and of course another occasion for people to have a beer. I’m a history nerd in general and I’m particularly interested in Prohibition so… fake holiday away AB! Whatever it takes to have a happy hour on the 8th floor, I’m in. Both of the entrances of the building had these "we want beer" signs posted. 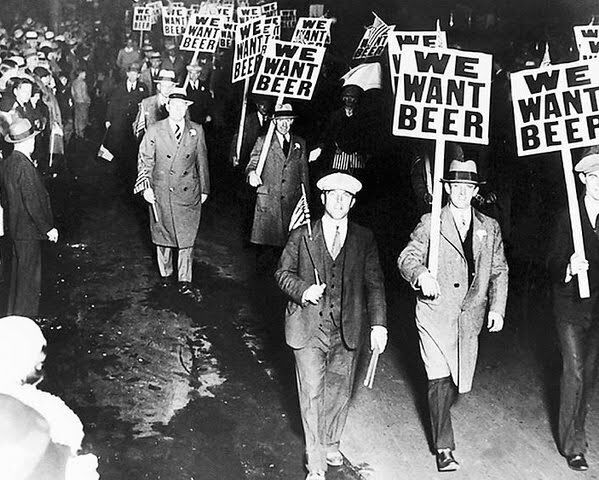 The were reminiscent of Prohibition protest signs. The constitutional amendment that repealed Prohibition was ratified on December 5, 1933. As you would expect they had twinkies on sticks and a chocolate fountain, just like in the 1920s! I liked the old tap handles that they dug up for the event. Some of the sales team were even dressed in old timey clothes. Budweiser was also sponsoring some Prohibition Day events out in the real world. One of them was fittingly hosted at the downtown Thaxton Speakeasy. It’s a really nice space and like two blocks from our apartment so you know that was a yes for me. There was free beer, there was free food. It was fun.